Edited by Galaad at 11:00, 15 Nov 2018. This is a mobile, TBS game with some gatcha element. The luck element affects you but is not determinant in your outcome: you can compete just as good as any high spender as a f2p using only strategy. Some of our HC members here can confirm, being f2p themselves and today part of the strongest players in the game. Luck makes it easier, money makes it faster, but on the long run, everyone gets there. However, a newbie has to accept it is natural he cannot be the same tier against someone daily playing since two years or so. Like in the old JVC games and mainly the Heroes of Might and Magic series, there is a good part of one�s capability to adapt to a current situation. This is decisive since the early game: which Legendary you get from your starting Leg idol (all have their use but some are definitely stronger than others), which creatures are your first to drop as 3 or 4 dots, etc. One always need to think ahead and consider all viable options and their variations depending on progress. One must NEVER rely on luck (ie counting on summoning only, this is gamble you can get either something fantastic first pull or fail some pulls in a row) but ALWAYS think ahead and strategize on the long term. Not only on the long term, sometimes it can be more beneficial to act for mid-term and in rare instances even short-term. There can be many situations and it would be too long to go through through a bazillion in detail. This game really makes an effort to reward the time investment of a player and his strategy above anything else. A small disclaimer would be that luck cannot be controlled, as such I strongly advise to "go with the flow" instead of trying to force your luck as it can become frustrating and burn you out, it is much more interesting to adapt with what you have and make the best out of it IMHO, everything is viable to some extent. With this in mind, we can now explore the different game modes. This is where one will spend the most of his time. The grind will become easier with time but at first every resource is scarce and decision making is crucial for your time management. Hopefully the game tactics with creatures synergies and combo dots gives sufficient replayability to always keep the farming entertaining, at least for me but I do regularly change PvE teams to explore new (and exciting!) battle tactics. There is many maps to quest. A Giant Adventure is the quest one will play during the first days in game as is not only the easiest but also one that delivers all gems needed to upgrade creatures at all times depending on a small RPG-like choice. Each other quests will give specific materials you will need to farm, pay attention to the loot description and use your energy according to your needs. There is also two types of events quests, these quests will be labelled as event quests. Some are rotating every other week while others are here only once a year. 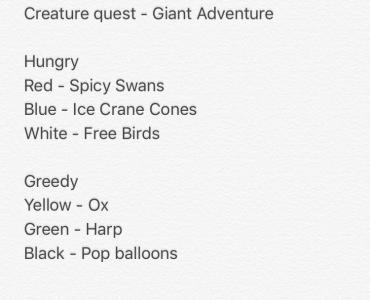 These quests have the particularity to drop Epic creatures on top of additional Rare ones. They are really worth to farm, it is suggested to get at least one fully awaken 3d (4d if you�re lucky) from them. Some of the lower tiers creatures you can get in all maps are very strong. Throughfully reading a creature�s description (special and awakenings) gives you a good idea of how good a creature is in the game. I�ll only mention poisoners are subpar, and stunners part of the strongest. There is also Expert Quests on a separate tabs, these will give you mostly enchanting material and diamond revives are not allowed in these. Roughly you will always play all maps because you will always need more material; you can rush it or play it on a more relaxed pace, the outcome is the same on the long run. This mode acts passively on your creatures and you will again need to set-up your priorities from the start. If you want to become better in pvp fast, you will focus on your keeps and color shrines. As you upgrade these, they will have some pre-requesites such as Castle level, specific research, and renown points you will have to get first. Kingdom is the longest grind so patience will be more than required. Focus on the color shrines that will benefit most the creatures you are using for example. Again always anticipate, you may have these creatures of another color sleeping for now that you will use later. The gold and gem mines are only useful if you�re lazy to quest. The Lady in the Lake is a real bargain, try to always have enough diamonds to be able to buy from her. You can research to lower her price. Every week end there is a creature that will wander around your lands, and if you defeat him you get additional loot, through three different levels of difficulty. Similarly to any other part of the game, you can either wait to grow stronger or develop tactics and rush it faster than others playing more casually. Every five levels of structures building will give a significant boost, except the very last one on some structures which is not worth it (wood/ore mines, libraries). Structures are maxed out when populated with fully awoken Legendaries but fully awoken Epics already do the job. Side note�: the major income of lower tier material is from the daily merchants, not from farming the quests ad vitam aeternam NOR the mines. Nothing much to say about from me, read bonuses descriptions and use strategy to succeed. There is three different tiers with different rewards, Bronze, Silver and Gold tiers. Every new player starts in bronze tier and will get promoted to a superior tier as he progresses. It is crucial to know that if you get promoted to a tier where you are no match for (enthusiast bronze players might get in silver too fast, very dedicated newbies will get in gold way too son for their level and roaster) you can get demoted willingly. To get demoted, you need to score less than 2k for two events in a row. At first it might be done naturally as you will literally get slaughtered if you're in a tier too strong for you. A good scale is about how much dungeons you can fill with at the very least 3d creatures. You can promote 3d creatures to 4ds if you have the resources (again, micro-management and long-term decisions making is vital here). Bronze tier only requires 1 dungeon. As long as you don�t have at least this dungeon with fully totemed and awakened (minimum 3dots) creatures, it is imo better to get back to bronze when you are promoted to silver, and use that time of pvp break to get stronger in questing. Because in Silver, you will need to populate three dungeons, and in Gold, five. Same logic applies for each tier. It can take many months to be able to compete sanely in Gold tier. The ranking is pretty straight forward, you gain prestige when you beat other players, and you lose some when they beat you. If they lose against your dungeon, you get extra prestige points. Again take the time to read all bonuses descriptions and pay attention to the color of the week bonuses, especially consequent during Legendary weeks in Gold tier. Edit Actually gold tier is working a bit differently than I thought. It's really like low gold is bottom gold now. Someone without super goober defense can still compete for the top 5%. He will have a hard time defending but if his offense is OK he can climb then shield near the end to keep the spot and get a Legendary along colored GE. A very exciting mode with prestige calculated from the overall performance of each individual in the guild with a per hour system, and a unique reward of War Coins that will equally benefit all and that they can spend in the shop. While clearly biased towards long term players, the strategy can get quite dense and is constantly changing depending on what your enemies will do at which time. Coordination between guild members is indispensable to make good guild wars. This was rather short and condensed, due to my lack of time. Do not hesitate to complement it with additional information or ask questions if some things remain a mystery. I know I flew over a lot of stuff but I hope these guidelines can give major axis to help new players understand the game better! Yoo, Galaad. Maybe branch Resource Management, because there are many different ones for many purposes, but they have a supposed logic about them, as well as timing. What do you think?